Peeled potatoes darken quickly. What to do? Usually cold boiled potatoes, many Housewives used the most simple way is heated in the microwave or fry in vegetable oil or butter. It's pretty delicious, no one disputes, but you can cook potatoes very tasty and, most importantly, very fast! Boiled potatoes cut into slices, fry lightly in oil (vegetable or butter), sprinkle with herbs, pour the beaten eggs, again fry. Cut the potatoes into slices, salted herring or mackerel cut into pieces, free from bones. Mix ingredients, adding onion and oil. Slice the potatoes and pickles slices, chopped onion, finely chopped boiled eggs. Mix ingredients, season with sour cream or mayonnaise (or salad dressing). Cut the potatoes in slices, put in greased pan, sprinkle with dill and parsley. Pour sour cream, salt, bake for 10 minutes. Sprinkle the dish with grated cheese, continue to bake until Golden brown. Potatoes mince (per 1 kg), add 0.5 cups of milk, 3 raw eggs, add 2 tbsp flour. If you wish to add cheese, feta cheese or grated cheese. Stir the potato mixture, form cakes and fry. When baking potato pellets inside, you can put the stuffing in the form of mushrooms, fried onions or slices of ham and cheese. Fry in butter onions, cut the potatoes into slices, put in heat-resistant cookware in a single layer, spread on the potato a layer of meat. Then on top of meat put a layer of fried onions, on top lay another layer of potatoes. Instead of stuffing potato casserole, you can add fried in vegetable oil mushrooms, vegetables (peppers, cabbage, tomatoes). Stir with a blender with a clove of garlic, greens, 2 cups of milk, egg, salt, pepper to taste, cover with layers of whipped mass, bake until Golden brown. Cold boiled potatoes - the constant ingredient of the huge number of salads. Potato goes well with salted and pickled mushrooms, beans, sweet pepper, sausage, ham, seafood. As you know, in Russia potatoes have started to grow in the eighteenth century, and since then, the potato remains a popular food product. 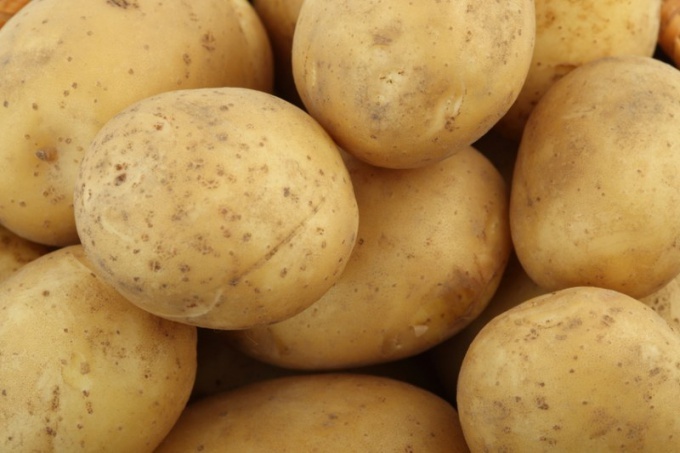 Potatoes, commonly called a "potato" is very useful because it contains a large amount of nutrients. 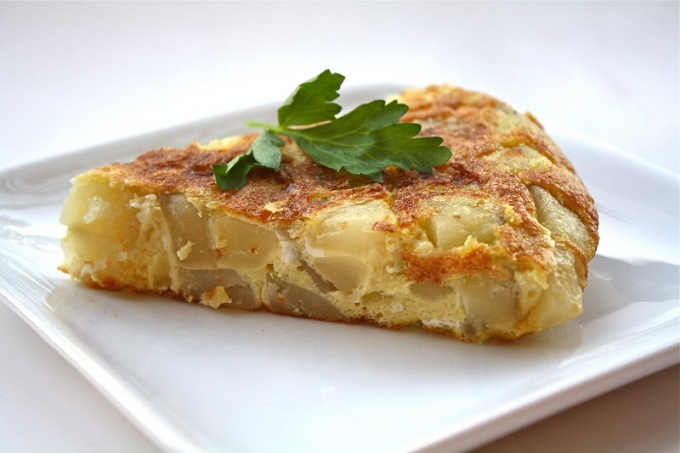 There are many different recipes of potato meals. One of the ways to eat potatoes - cook it. And, it would seem, what could be simpler - boil a potato, but it can be done in several ways. Let us consider two simple, yet easy recipe of boiled potatoes. First - boil the potatoes "in uniform". For this we need a few dirty potato tuber, pot, water and salt. Put the potatoes in a saucepan, cover with water and place on high heat, not forgetting to cover it. Bring the water to a boil and add a pinch of salt, reduce the heat, cover again with a lid, continue to cook at least 15-20 minutes. To determine the readiness of potatoes should pierce the tubers with a fork or thin knife. 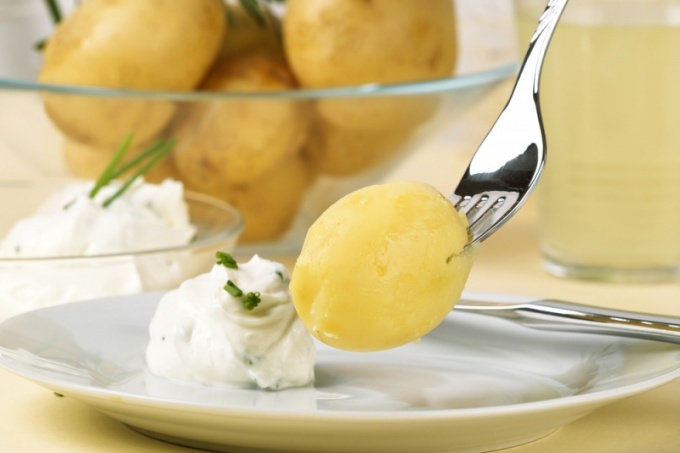 If the fork or knife are potatoes in butter, then time to drain the water and put the potatoes. Second - cook the potatoes, brushing her before. It will take a little more time, but cooked peeled the potatoes much faster. 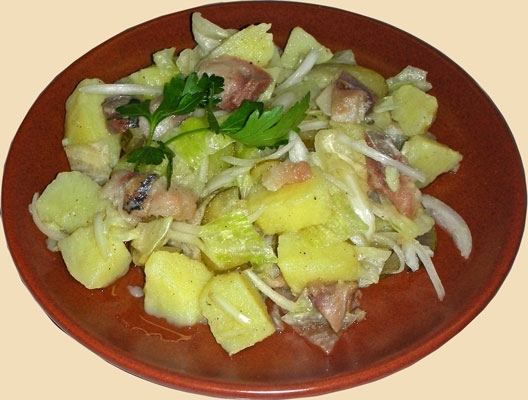 The procedure of cooking peeled potatoes is no different from cooking the potatoes "in uniform". Peeled potatoes will cook much faster if it is pre-cut into two or three parts, and putting in a pot, cover with water so that the tubers were barely covered with water. Also welded this way of potatoes, you can make one dish – mashed potatoes. Just mash boiled potatoes, add warm milk, butter, and mix thoroughly. To cook the potatoes "in uniform" is often the most preferred option. Because to cook the potatoes "in uniform" does not need to be cleaned. And cleaned potatoes, few people loves. Moreover, it is noticed that two or three potatoes, cooked "in uniform" is much faster to eat than the same amount of treated potatoes. And all because during cooking raw potatoes does not give a portion of their nutrients into the water and saves them in the tubers. Since Russia brought potatoes, he has come a long way from the "exotic foreign" to "national" vegetable, almost completely displacing the turnips from the Russian table . It is easy to explain, given that potatoes yields a bountiful harvest at a low cost, well kept and the food from it simple and delicious. It can be cooked in different ways, combining with many products. Plain boiled potatoes may be used not only as a garnish or as an ingredient of various salads - add in boiled potatoes and dressing right here in front of you is quite a separate dish. Select tubers about the same size. Thoroughly wash. Put in a saucepan and cover with cold water. Add salt at the rate of 0.5 teaspoon of salt in 2 liters of water. Put the saucepan on a high heat and bring to a boil. Turn down the heat to minimum and cover. Cook for 20-25 minutes. If the tubers are large, increase the cooking time. Try readiness with a fork. If the prongs down easily, the potatoes are ready. Drain the water. Wash and peel the potatoes. Remove all the "eyes". If there is a green area, be sure to cut them. If the tubers are too different in size, the largest cut in 2-3 pieces. Otherwise, small potatoes will fall apart when large will still be damp. Type in a suitable volume pot with water, she then covered the tubers only slightly, "the finger". Put on fire and bring to a boil. Place the peeled potatoes in boiling water and close the lid. Simmer 15-25 minutes. 5 minutes until cooked add salt. Optionally, you can add aromatic herbs. Place them in a "bag" of cheesecloth, tie it to the lid or the handle and dip it into the pot with the potatoes, and then remove. The duration of treatment depends on the type of potatoes, the subsequent use (for salads can be a little nedoverie) and the preferences of consumers (someone who likes Parasurama). Check the readiness of the tubers with a knife. If the potato slides off it easily, it is ready. Add 30-50 grams. butter, if you use potatoes as a side dish or a separate dish. Slice the onion into small cubes, greens finely crumble. Crush garlic in garlic press and RUB with a small amount of salt. Saute the onion in vegetable oil. Add black pepper (it is better to grind in the mills, so it will be fragrant), herbs and garlic. Add the dressing to the hot boiled potatoes and mix well. To preserve the vitamin C in potatoes (and other vegetables), while processing, use a stainless steel knife. In contact with iron vitamin C is destroyed. If you cook potatoes for salad, then after I drained the water immediately rinse it with cold water. So the potatoes will be easier to clean and neater to cut. If you are cooking old potatoes, a little podkislit water with vinegar or citric acid. This prevents darkening of the potatoes. To "uniform" when cooking is not cracked, pierce the tubers with a fork. The potato is one of the most popular vegetable side dishes. Dishes of boiled potatoes in equal measure to decorate the table during a simple family dinner and festive dinner party. There are several techniques that allow the potatoes to cook much faster while retaining its taste and useful properties. Many potato varieties are characterized by their ability to quickly soft after boiling. If time preparing side dishes is limited, take for cooking round vegetables with firm flesh and light brown skin. This variety is prepared fairly quickly and does not lose its shape during thermal processing. To prepare mashed potatoes choose crisp varieties with white and friable flesh. Clear the required amount of potato with vegetable knife. This device will save you time and effort, and will also allow you to get a nice and evenly peeled vegetables. Note that the smaller are the parts that you cut the potatoes, the faster shecooked. Put the potatoes in a pot and add hot water. Put the saucepan on a high heat and wait until the liquid starts to boil. Once the water is boiling, add salt to taste, add a few tablespoons of butter and reduce heat. Cook the potatoes on high heat is not recommended, because the likelihood is high that the inside of the tubers will remain raw. Animal fats included in the composition of oil form on the surface of the protective film. Potatoes which is this "cap" is cooked twice as fast. After 15-20 minutes drain the water and remove the vegetables from the pan. 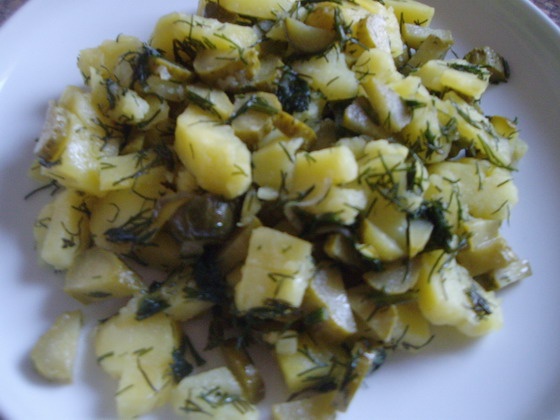 Serve boiled potatoes, garnished with fresh greens, slices of cucumber and tomato. 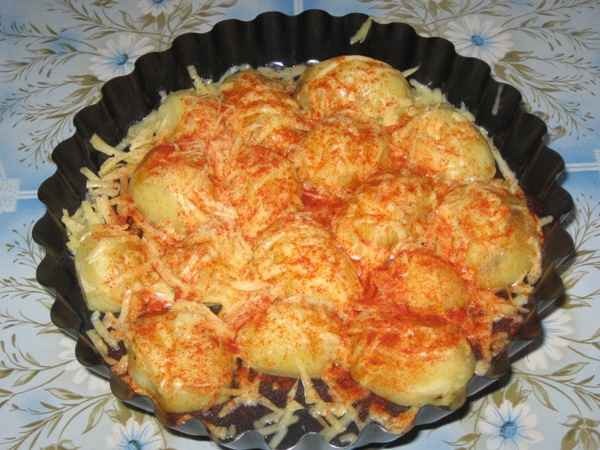 To cook and crisp the potatoes for a few minutes and in a microwave oven. Peel a few medium-sized tubers, cut them to pieces. Lubricate cookware that is suitable for the microwave, with butter or oil. Lay on it the potatoes, salt and season it. Cook the potatoes for 8-10 minutes in medium waves. The finished dish sprinkle with parsley and dill and serve. 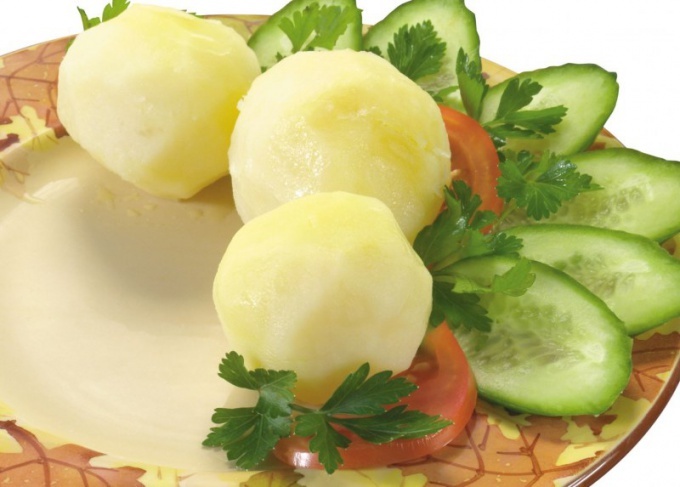 Boiled potatoes – one of the delicious and hearty side dishes. This is a great addition to grilled chicken, pork, mushrooms, fish. It is prepared simply and quickly. However, that potatoes are not mashed potatoes during cooking, it is necessary to consider some nuances. For boiled potatoes choose pink or yellow varieties. To tenderize tougher than vegetables white tubers. Take the tubers of the same size. Or cut large potatoes into several sections, so that the vegetables cook evenly. Salt potatoes better at the beginning of cooking. Salt will not let the vegetables be soft after boiling. Also before you drop the potatoes in water, pierce them with a knife. Potatoes are difficult to tenderize in a weakly acidic medium. So in a pot of boiling water add a little vinegar, a few slices of pickle or lemon wedge. Don't worry, no sour taste dish will not acquire. In the preparation of soup, the potatoes should be dipped in broth with vegetables containing acid, for example, cabbage or tomatoes. Cook the potatoes over moderate heat. If the flame is strong, the outside will quickly fall apart, and inside will remain raw. To the potatoes are not seethe, there is such a trick. Wait until the pan with the vegetables to boil. Pour a little hot water and add cold instead. Or another way – let simmer potatoes for 15 minutes. Then drain 2/3 of the water and covariate dish with the lid closed for a couple. 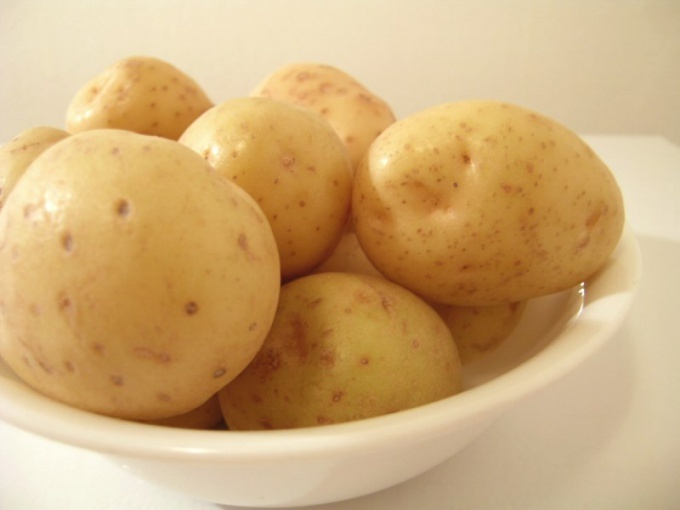 The basic amount of vitamins and minerals in potatoes is under the skin. And not to throw in the trash nutrients, tubers is recommended to cook in uniform. Before cooking they must be well rinsed under running water and pierce in several places with a needle. It will not give you the potatoes be soft after boiling. The peeled potatoes suggest in a pot with boiling water, not cold. So the vegetables retain more vitamins and minerals. Also in the pot with the potatoes, you can omit a few cloves of garlic, a few peas black pepper, Bay leaf or parsley. It will significantly improve the taste of the dish. 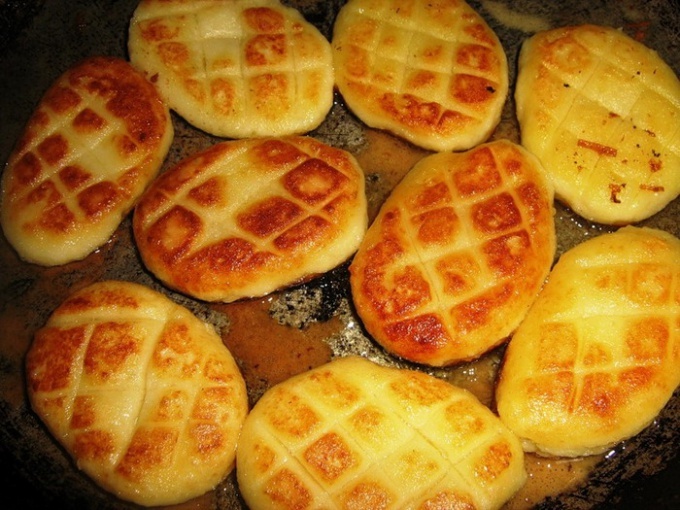 Insanely delicious boiled potatoes obtained by the following recipe. Young tubers are medium in size, clean and rinse. In an enamel saucepan, pour water, boil and add salt. Put the vegetables and cook over heat slightly less than the average for 10 minutes. Then drain the water, but instead pour the potatoes milk at room temperature. Reduce heat to low and continue to cook until tender. That the milk is not burnt to the bottom of the pan from time to time it needs to be shaken. A feast put on plate, add butter and sprinkle with herbs. Serve as separate dish or as a side dish.